Part of a comprehensive water, sanitation, and hygiene (WASH) program includes the development of regular hand-washing practices. In many communities, tippy tap stands are installed and used to make this possible. A tippy tap is a hanging jug that is filled with and tipped to dispense clean water, with soap kept nearby. Typically, this was the solution that was used in North Kamagambo as well. However, the schools in the area found that tippy taps were not the best solution in their context. The children didn’t like the tippy taps, and the soap and jugs often went missing. 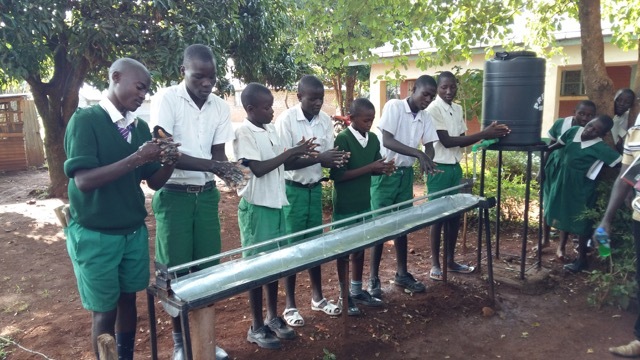 In response, the schools hosted a competition and allowed children to come up with new designs for hand-washing stations. The winning design was a small tank with a spout that pours out into a trough at waist-level. Now, all of the schools in the community are adopting this sustainable, replicable, easy-to-model! It’s incredible to see the innovation of the children, as well as the leadership and empowerment emerging from within the community as they drive their own solutions for improved health. In partnership with Lwala Community Alliance, Blood:Water has committed to the support and care for people living with HIV/AIDS and at-risk populations. Through the integration of HIV and WASH, HIV-positive and at-risk individuals are empowered to live healthy and positive lives. These efforts are supported by trained community members who lead community-led total sanitation efforts; an increase in access to safe and reliable water supplies; advocacy against discrimination; and the provision of high-quality HIV care at the health center. Blood:Water has provided technical and financial support to Lwala Community Alliance since the launch of the Lwala Community Health Centre in 2007. This has allowed Lwala Community Alliance to improve clean water access in the community, especially near the health facility and at primary schools in the area; to start WASH training in the community; to improve the quality, availability, and organization of comprehensive HIV/AIDS health care and support services; and to expand sanitation coverage and increase the number of WASH-compliant households in North Kamagambo. Improve community-level access to HIV prevention and care and support services, including psychosocial support for people living with HIV and those at high risk in integrated HIV and WASH programming. Increase community-level access to safe water and sufficient and reliable hygiene facilities and latrines for people affected by or living with HIV/AIDS. Strengthen capacity of community structures to sustain HIV and WASH services in North Kamagambo by 2020. Lwala Community Alliance is a Kenyan-founded health and development agency that exists to build the capacity and advance the comprehensive well-being of people living in North Kamagambo, Kenya. Founded by Kenyan doctors, Milton and Fred Ochieng, Lwala Community Alliance works in a region with some of the highest HIV prevalence, and infant and child mortality rates in the country. Through community-based health initiatives, Lwala Community Alliance is able to capitalize on existing trust relationships in the community, which allow for direct links to be made to clinical-based services that provide specialized care and support. Community health workers are engaged to provide supplementary support, education, and guidance to HIV-affected households, while primary care programs are offered through the hospital and home-based visits. In addition, HIV support groups are facilitated, and community-wide outreaches and trainings are offered to target the issues of stigma, health behaviors, and prevention of HIV and other infections. 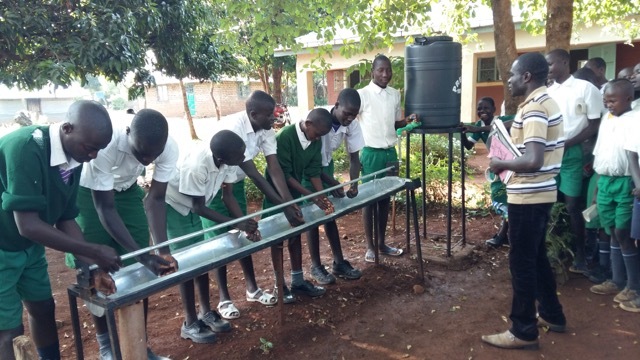 Lwala Community Alliance also works with HIV-positive individuals to lead community-led total sanitation, and to improve quality water access, reliability and supply initiatives in the community. Background: Following 70 years of British colonization, Africans began to protest Great Britain's rule over Kenya. In 1952, after years of unrest and rebellion, Governor Sir Everlyn Baring declared a state of emergency for the country, eventually forcing the colonial government to allow for African representation in the Legislative Council. Eight African leaders were elected, leading to the formation of the Kenya African National Union (KANU). KANU attained 83 of the 124 seats in the House of Representatives in 1963, and gained full independence later that year under Mzee Jomo Kenyatta. After gaining its independence, the country focused on establishing peace and stability, and has since played a large role in establishing peace and stability in East Africa as a whole.